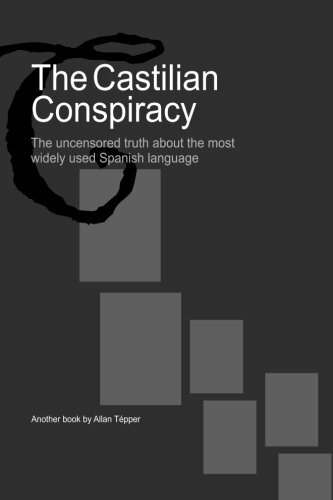 The Castilian Conspiracy reveals the uncensored truth about the most widely used Spanish language. Through personal studies and anecdotes, quotations, historical facts, little-know rules, and unique observations, Tépper unfolds while he proposes improvements for the language and its speakers. “With Castilian, we can cross 20 international borders without losing the message...” Vicente Fox Quesada Former Mexican President This book includes color photographs and color comparison charts. Allan Tépper is a consultant, multi-title author, tech journalist, translator, and language activist who has been working with professional video since the early eighties. Since 1994, Tépper has been consulting both end-users and manufacturers through his local company. Via TecnoTur, Tépper has been giving video tech seminars in several South Florida’s universities and training centers, and in a half dozen Latin American countries, in their native language. Tépper has been a frequent radio/TV guest on several South Florida, Guatemalan, and Venezuelan radio and TV stations. As a certified ATA (American Translators Association) translator, Tépper has translated and localized dozens of advertisements, catalogs, software, and technical manuals for the Spanish and Latin American markets. He has also written contracted White Papers for manufacturers. Over the past 18 years, Tépper’s articles have been published or quoted in more than a dozen magazines, newspapers, and electronic media in Latin America. Since 2008, Allan Tépper’s articles have been published frequently —in English— in ProVideo Coalition magazine.